He’d considered going to the RCA School of Design in London, but opted for Umeå, in the end. Not only is Umeå a long way up in Sweden, it’s also way up there in the rankings of the world’s foremost design schools. RCA would have set Viljami Räisänen back quite a bit, whereas Umeå design institute was free. So that’s where Viljami Räisänen got his master in transportation design. Was designing trucks what he’d set his sights on, I was curious to know. No, it was cars for Viljami Räisänen, probably still is judging by our conversation. Räisänen, who hails from across the water, in Finland was just about to conclude a nine-month internship at Toyota Material Handling in Mjölby, when I met him. “I’d heard about this competition and knew that two Finnish girls had won it two years previously,” he said. So, together with two other Umeå students, Räisänen entered the Toyota Logistic Design Competition in 2016, and won third prize. “Sometimes I want to give [the truck] a radical shape at the beginning of the design process,” Räisänen said. We’d been talking about how ideas and suggestions are batted back and forth between the engineers and the designers. And how the design can get squeezed. 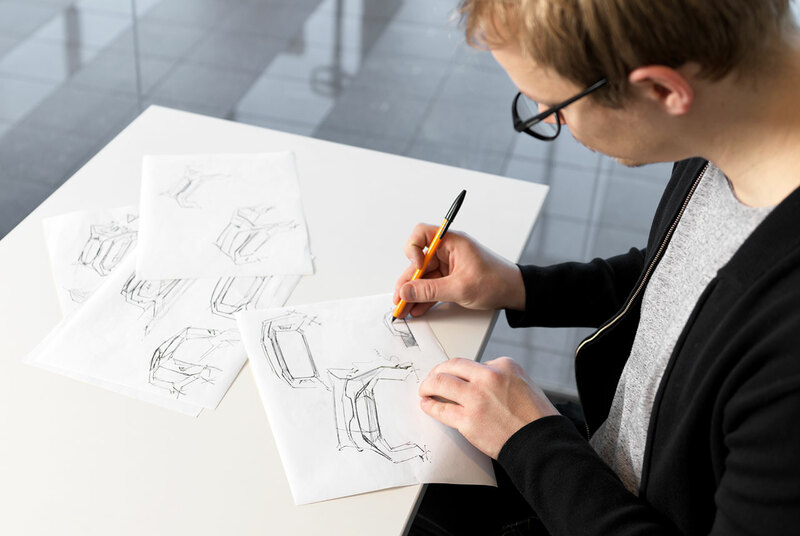 “This isn’t exactly car design… but every principle in design can be applied to any product.” Viljami Räisänen talked about what he considered the most important things to keep in mind in his job: functions and user needs. “This thinking goes for any product,” he said. Räisänen believed the biggest difference between car and material handling design is to do with emphasis. With cars the marketing aspect is crucial, in Räisänen’s opinion. And with trucks it’s the functions that are the main focus. What made Viljami Räisänen go into design? “Ever since I was a kid I wanted to do something creative. I love using my imagination and combining it with practical aspects,” he said. “I wanted to work for myself and make money out of it.” At the beginning he was interested in all kinds of design, such as graphics, for instance. But the thing that fascinated him the most was drawing cars. No one knows what the future will look like until it knocks on your door. Chances are it could be T.A.D., the Toyota Automated Delivery concept, bringing you that large package from Ikea right to your doorstep. Said Räisänen about how it all came about: “I think automated delivery will become a big thing, once traffic regulations allow it. And I thought Toyota should get involved in the area.” So, he chose to develop an autonomous delivery vehicle. “The functions I wanted determined the design process.” Räisänen soon found his invention didn’t look anything like a car. “With its wide-looking ‘limbs’, it reminded me more of a strong animal… a polar bear, maybe,” he said. The idea is customers select their items with the help of a smart-phone application. T.A.D. finds the packaged product in the store, and then carries it, in its large ‘belly’, to their home address. Should be a welcome invention. As a young man, Räisänen has every right to dream. with Toyota KAMU, a forklift concept. 2016-2017 Employed as trainee at Design Center. 2016 Designer of T.A.D., Toyota Automated Delivery concept, student’s own concept project. 2017-2018 Umeå Institute of Design, MFA in Transportation Design.